Foundation paper piecing is a great way to be able to accurately piece quilt blocks that are made up of many small pieces. Ashley Hough shows you how to create a small version of a basic log cabin block using a foundation paper piecing method. When foundation paper piecing you will need a foundation. This is normally in the form of a template printed on either paper or lightweight fabric. If using a paper template the template can be easily removed after the block is stitched, whereas if you use a fabric template it can be more difficult to remove or you can simply leave it in place. Ashley shows a paper template for a log cabin block and explains what the markings on it mean. 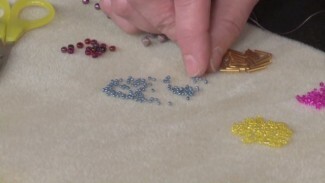 Most templates will use either numbers or the alphabet and Ashley explains how you use those to know what order to sew your pieces together for the block. 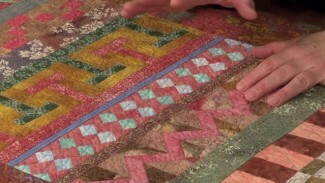 Once you understand all of the markings on the template you can begin stitching on your pieces. Ashley shows you how to start with either the number one piece, or the letter A piece. She explains what side of the template the fabric should be stitched to and why and gives tips on how to temporarily attach the first piece to the template. From there Ashley shows how to work your way through the template, attaching, trimming and pressing each piece as you go. Flipping, folding and trimming your fabric as you go is an easy way to be able to know where to line up the next piece of fabric, however it is not the only way to foundation paper piece. 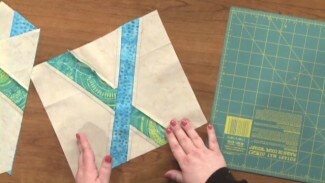 You can also learn more paper piecing techniques with other short videos or with this class that explains all you need to know to start paper piecing. I do apologize however we do not currently have closed caption with our videos. Can I save this video so I can see it on my iPad when I do not have internet access? I notice you do not reverse stitch at the seams or go over the lines. I use your method when I make cards but is this still okay for a quilt top? Is the simple act of stitching the next line enough to keep it together? I have seen some videos where they backstitch. 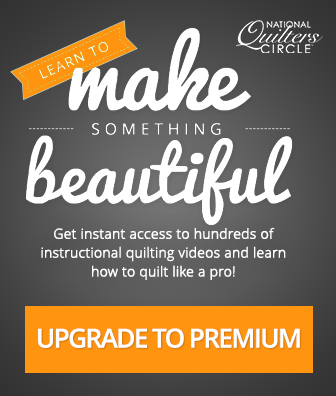 What has your experience been with the long term use of the paper pieced quilt tops? I am getting ready to do a large PP quilt top and want to be sure it stays together. Thank you! Yes, the act of stitching the next piece over the previous line of stitching is enough to hold in in place. Also, the quilt gets extra security when it gets quilted. However, if you are at all worried about the seams coming apart you can back stitch at the beginning and end. I would suggest that you at least sew across the seam allowance at the beginning and the end of each seam line. 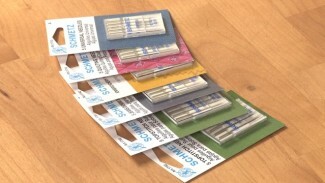 Backstitching gives extra security that seams will not come unstitched. I’ve never seen it recommended to start and stop exactly on the seam line. You did not mention that the first piece is attached to the paper right side up so that all pieces are sewn right sides together. With the fabric you used it did not matter. However, with prints, it will be very important.